What do 46-foot-long teak-wood Dragon Boats have to do with poetry and tasty rice dumplings stuffed with sweet treats? 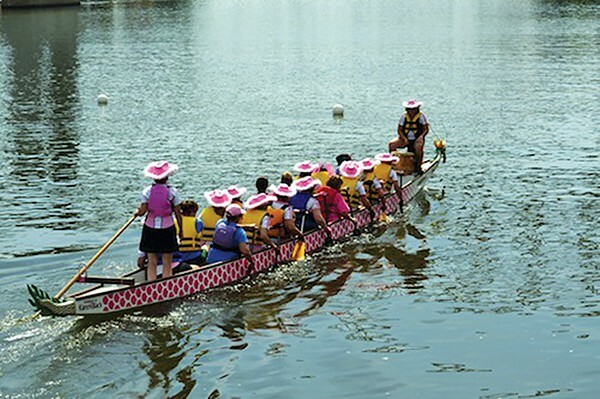 Today, in America, Dragon Boat racing exists primarily as a festival sport and corporate team-building exercise. Its Chinese origin dates back to 278 B.C. and is inspired by the death of poet and politician Qu Yuan, who, in despair following a rift with his king, threw himself in the Miluo River to drown. According to tradition, friends and fans took to their boats and raced to save the poet, or at least to retrieve his remains before it was eaten by fish or pecked apart by hungry birds. When nobody could find a body, the people tossed sticky rice balls into the water so the fish and birds would have something to eat other than Qu Yuan. This is said to be the start of both Dragon Boat racing and the banana leaf-wrapped treats called zongzi. The traditional boats are awfully narrow, but there's good news for everybody who's over-indulged in zongzi — or barbecue, as the case may be. The boats used for Memphis' Duncan-Williams/St. Jude Dragon Boat races are made of fiberglass. They still have the traditional dragon head at stem and tail at stern, but are specifically designed to accommodate American appetites. Dragon Boats require 22-person teams. One person steers. Another pounds out a steady drum rhythm. The remaining 20 are charged with synchronized paddling.